Earlier this week it was announced that UN Ambassador Nikki Haley will resign her post, taking effect at the end of this year. President Trump, who praised Haley’s work and emphasized that she was leaving on good terms, said that he would name her successor at some point in the next several weeks. The move not only shocked experts and media pundits, but also, reportedly, came as a complete surprise to many inside the Trump administration as well. At times, Haley’s center-right foreign policy views have collided with those of others in the administration. President Trump’s consistent obfuscations on all things Russia, and his seamless praise for Russian President Vladimir Putin were diametrically opposed to Haley’s harsh words regarding the country’s blatant misbehavior. Former Chief Strategist and brainchild of the populist movement Steve Bannon views every example of American involvement in foreign affairs through an isolationist lense – a worldview that comes in direct conflict with Haley’s belief in the importance of the projection of American power abroad. National Security Advisor John Bolton is not shy in expressing his position that the UN is largely a waste of time and resources that should be redirected to ventures where the United States has sovereign control. These incongruencies are just to name a few. Prior to Haley’s resignation, Bolton and Secretary of State Mike Pompeo have enjoyed an increased level of autonomy in determining Americas course in foreign affairs – sometimes to the detriment of Ambassador Haley’s ability to operate. Both men are charismatic, and much more popular with President Trump than their predecessors were, which, in this administration, is perhaps the best gauge of real power within it. They also hold policy views that are hardline when compared to those of the men they replaced, and by-and-large those of Nikki Haley as well. Secretary Pompeo, for instance, has toyed with the idea of the CIA assassinating North Korean Dictator Kim Jong Un. And John Bolton, not to be outdone, has advocated the probable need for a first strike against the DPRK. Ambassador Haley’s approach was much less aggressive. She advocated the use of sanctions and increasing pressure on the Chinese to do more to influence the rogue Kim regime, while also making it clear to the North Koreans that the US would not hesitate to use military force if provoked. Both Pompeo and Bolton were staunchly opposed to the Iran nuclear deal, which the international community generally agreed Iran was in full compliance with. It also, importantly, had the support of the majority of American military leaders, including several who hold/held prominent positions in the Trump Administration. In fact, it may be the case that the replacement of Ret. Gen. H.R. McMaster, one of the deal’s defenders, with Bolton was the decisive step in its demise. While Ambassador Haley was an outspoken advocate of decertification, she approached the issue in a much more prudent and measured way than the ill-advised rhetorical aggression consistently displayed by Pompeo and Bolton. There are, of course, a greater number of examples in which Haley stood firmly united with the rest of the administration. But she served as a constant buffer for the more extreme elements within it, and her resignation will likely have destructive implications in regards to keeping those sentiments at bay. Aside from the policy ideas that the administration will be missing with her absence, they will lose a woman in Ambassador Haley who was widely considered to be the most popular appointee in the Trump administration. A Quinnipiac poll from April had her approval rating at a stellar 63%, and an even more impressive 55% among Democrats. No other official in the administration has ever come close to reaching these numbers, and her departure will only fan the flames of the rampant polarization consuming our political discourse more and more with each passing day. 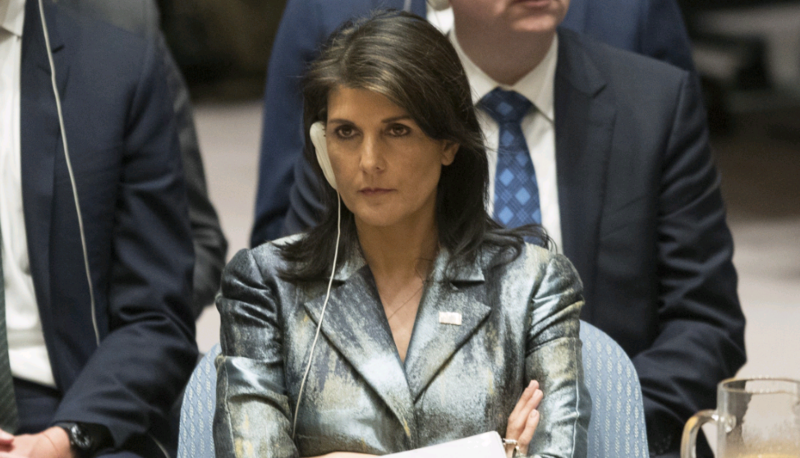 Nikki Haley embodies the ideal temperament of a government official. She made some mistakes, she left some problems unsolved, she faced significant challenges from both within and outside the administration. These facts are undeniable. But she always stayed true to her own beliefs, and didn’t allow herself to be swept up in the partisanship and tribalism that have defined the past several years in American politics. In an administration that prides itself on “telling it like it is,” she was one of its few members who consistently lived up to the slogan. America, and indeed the entire world, will be less safe without Nikki Haley’s pragmatic influence.